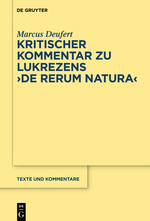 M. Deufert, Kritischer Kommentar zu Lukrezens "De rerum natura"
Marcus Deufert, Kritischer Kommentar zu Lukrezens "De rerum natura", Berlin-Boston, 2018. The critical commentary justifies the text of the new edition of Lucretius' De rerum natura in the Bibliotheca Teubneriana. It discusses many passages which are difficult or corrupt, examines competing conjectures and offers new solutions. Beyond textual criticism the commentary illuminates philosophical, literary and stylistic aspects of the poem.